Animax, Asia’s first channel specializing in anime programming, is set to usher in 2014 with the brand new blockbuster anime TV series Space Dandy in January! As Animax’s latest simulcast title, the fun, tongue-in-cheek and over-the-top show will debut across Asia as it airs in Japan! Space Dandy is set to premiere on 5 January, airing on Sundays at 10pm (SG, MY, HK, PH, TW) / 9pm (JKT, TH) in a same-time-as-Japan simulcast, first and exclusively on Animax. In addition, Space Dandy will debut in India on the same day, at local primetime 10pm (IST) also on Animax. The fresh, comedic sci-fi anime series is Animax’s second simulcast in the short span of three months, following Coppelion. Animax viewers will be able to enjoy Space Dandy with subtitling in local languages including English, Thai, Bahasa Indonesia and Chinese, with an option of English dubbed audio, in applicable territories. 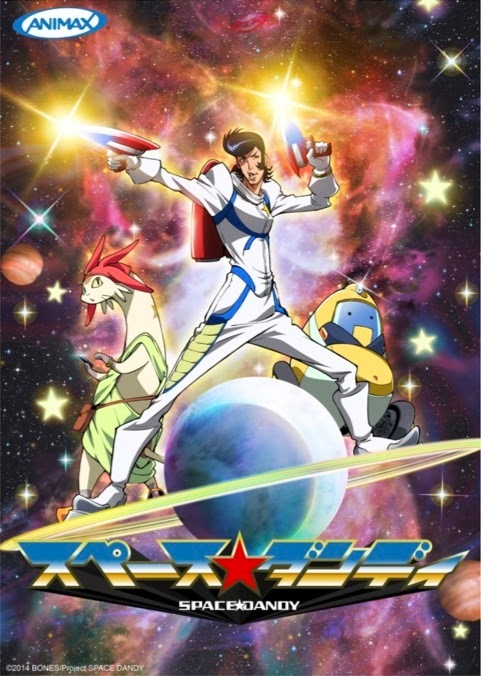 A dazzling new alien-hunt, space adventure-themed Space Dandy follows the dandy space adventurer named Dandy, with a to-die-for pompadour, on his amazing journey of discovery through the universe! “The wonderful opportunity to enjoy Space Dandy with Japan’s audiences is Animax Asia’s gift to our viewers for a great start to 2014. We look forward to offering more top notch anime programs and delivering the best entertainment experiences on- and off-screen in the new year,” said Virginia Lim, Vice President, Asian Content, Networks, Asia, Sony Pictures Television. Traveling across galaxies, the dreamy Dandy is in search of aliens that no one has ever laid eyes on. Each new species that Dandy discovers earns him a hefty reward, but he has to be quick because it is first come, first served, so his mission is to find new aliens faster than anyone else. Without a care for the little things in life and looking for his dream out there, the character of Dandy is being brought to life by consummate voice actor Junichi Suwabe (Fullmetal Alchemist, Bleach) who has lent his voice to hundreds of anime and video game productions. Dandy is in the company of the rundown vacuum cleaner of a robot named QT, who is voiced by Uki Satake, model and member of Japanese idol girl group, 9nine; along with the dim-witted cat-like alien, Meow, played by voice actor Hiroyuki Yoshino (Mobile Suit Gundam 00). Accompanied by his sidekicks, Dandy bravely explores unknown worlds in search of undiscovered inhabitants of unimaginable shape and form. The best groomed alien hunter of all space and time is set for an adventure to the edge of the universe! Hailing from the creative team behind the critically acclaimed classic anime hit Cowboy Bebop, production of Space Dandy is led by Shinichiro Watanabe (Cowboy Bebop, Samurai Champloo), including director Shingo Natsume (Fullmetal Alchemist: The Sacred Star of Milos), with screenplay by Kimiko Ueno (Crayon Shin-chan movie), Dai Sato (Cowboy Bebop, Eureka Seven) and Keiko Nobumoto (Cowboy Bebop, Wolf’s Rain). Character design is by Yoshiyuki Ito (Star Driver) while the spacecrafts are designed by Thomas Romain (Basquash! ), and animation production is undertaken by Tokyo-based anime studio, Bones (Fullmetal Alchemist Brotherhood, Soul Eater, Eureka Seven AO). Performing the series’ upbeat disco-like theme song ‘Viva Namida’, singer Yasuyuki Okamura (City Hunter 2) was also drawn into a fully animated teaser music video, singing and grooving to the beat with the characters of Space Dandy. Get off to a fun and laughter-filled start to 2014 with Dandy and his companions on their search for the strangest sights and greatest adventures of the universe in the out-of-this-world Space Dandy, only on Animax!